The Modi government's pledge to marginally increase health care spending to 2.5 per cent of the total Gross Domestic Product by 2025 has not gone down well with health specialists. 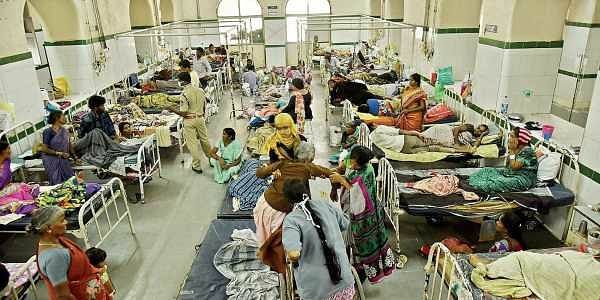 NEW DELHI: The Narendra Modi government's pledge to marginally increase health care spending to 2.5 per cent of the total Gross Domestic Product by 2025 has not gone down well with health specialists, including the world’s leading medical journal The Lancet, which has called the government’s plan “disappointing” as the global average is already 6 per cent. In a hard-hitting editorial in its November 14 issue, The Lancet has also called India’s aspiration to catch up with China, given its poor health track record, an “embarrassment”. India currently spends just 1.2 per cent of its GDP on health, one of the lowest proportions in the world. In terms of pure numbers, it stood at `48,880 crore in 2016-17. “We are disappointed by the lack of ambition of Prime Minister (Narendra) Modi’s government to invest only 2.5 per cent of its GDP into health care by 2025, when the global average for countries is about 6 per cent,” the journal has written in its editorial. “The rise in India’s economic fortunes and its aspiration to progress to the same level as its neighbour, China, is something of an embarrassment, given how improvements to health trail so far behind,” the journal goes on to say. In a new health policy released in March this year, the Centre had said that it would allocate two-thirds of its budgetary resources to primary health, convert primary health centres into “wellness centres” with a focus on prevention and health promotion, and deploy more doctors and paramedics in public hospitals that are facing shortages. The policy had also set several quantitative goals, including increasing India’s life expectancy at birth from 67.5 to 70 years by 2025 and reducing premature mortality from cancer, cardiovascular diseases, chronic respiratory diseases and diabetes by 25 per cent by 2025. However, public health experts pointed out that a low health care budget is a big hindrance in achieving much of these targets. Oommen John, a senior research fellow and internal medicine specialist at The George Institute for Global Health, a health research institution based in the national capital, said India cannot strengthen primary health care, nor can it improve secondary and tertiary care unless the government invests more in the sector. “Public hospitals in India have not achieved much in providing quality health care except for immunisation up to two years, institutional delivery and postnatal services, due to abysmally low health care budget and poor utilization of funds. It is disheartening that the trend continues,” he said.